The USS Constitution is the world's oldest warship still afloat. By 1797, she, along with five sister ships, provided the newborn American Republic with its first fighting Navy. During the War of 1812 against Britain, our naval victories were especially important to Americans because Britain's fleet represented her claim to world power. To stifle American commerce and protect her own, British warships attempted to blockade important seaports. On August 19, 1812, Captain Isaac Hull slipped the USS Constitution out of Boston harbor to engage and subsequently sink the British frigate HMS Guerriere, commanded by Captain James Dacres. The 35-minute shootout gave the USS Constitution the nickname "Old Ironsides" after one of the defeated British seaman, watching cannonballs bounce off the USS Constitution.s live oak timbers, shouted: "Huzza! Her sides are made of iron." This was the first time since the American Revolution that a British man-o-war struck its colors to an American. News of the victory sent American morale sky high. This morale manifested itself in a number of ways, including songs and prints. 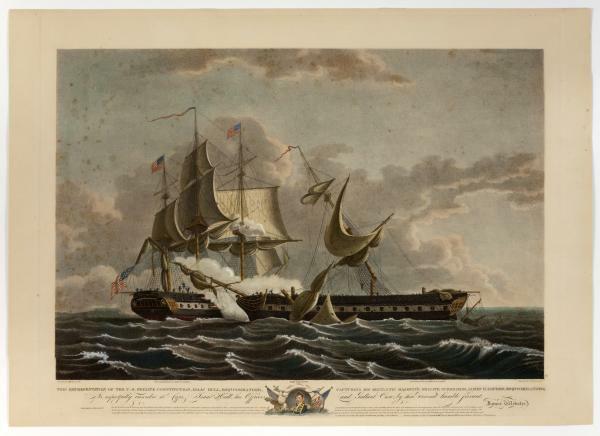 This image, painted by T. Birch and engraved by C. Tiebout, depicts the USS Constitution and the HMS Guerriere in the midst of their battle. The inscription below provides details about the battle itself while the portrait in the center is of Isaac Hull, the commander of the USS Constitution. THIS REPRESENTATION OF THE U.S. FRIGATE CONSTITUTION, ISAAC HULL, ESQR. COMMANDER, CAPTURING HIS BRITTANIC MAJESTY'S FRIGATE GUERRIERE, JAMES R. DACRES, ESQR. COMMANDER; Is respectully inscribed to Capt. Isaac Hull, his Officers and Gallant Crew by their Devoted humble Servant, James Webster. Lat. 41, 42, N. lon. 55, 48, W. Thursday, Aug. 19, fresh breeze from N.W. and cloudy, at 2 P.M. discovered a vessel to the Southward, made all sail in chase; at half past 3, made out the chase to be a frigate; At 5 the chase hoisted three English ensigns; at 5 minutes past 5, the enemy commenced firing; at 20 minutes past 5, set our colors, one at each mast head, & one at the mizen peak, and began firing on the enemy, and continued to fire occassionally, he weaving very often, and we maneuvering to close with him, and avoid being raked; at 6, set the main top gallant sail, the enemy having bore up; at 5 minutes past 6, brough the enemy to close action, standing before the wind; at 15 minutes past 6, the enemy's mizen mast fell over on the starboard side; at 20 minutes past 6, finding we were drawing ahead of the enemy, luffed short round his bows to rake him; at 25 minutes past 6, the enemy fell on board of us, his bowsprit foul of our mizen rigging. We prepared to board, but immediately after, his fore & main mast went by the board, & it was deemed unnecessary. At 30 minutes past 6, shot ahead of the Enemy, when the firing ceased, on both sides; he making the signal of submission by firing a gun to leeward. Entered according to Act of Congress the 18th day of August 1813 by James Webster of the State of Pennsylvania. (directly under picture): Painted by T. Birch, A.C.S.A. The Constitution had 7 men killed & 7 wounded. Fought August 19, 1812. The Guerriere had 15 men killed & 63 wounded. Engraved by C. Tiebout A.C.S.A. (above portrait of Hull): VENI. VIDI. VICI. Exact Title: This representation of the U.S. frigate Constitution, Isaac Hull, Esqr. commander, capturing his Britannic Majesty's frigate Guerriere, James R. Dacres Esqr. commander; [graphic] : is respectfully inscribed to Capt. Isaac Hull, his officers and gallant crew; by their devoted humble servant, James Webster. Author/Creator: Entered by James Webster, Painted by T. Birch, A.C.S.A., Engraved by C. Tiebout, A.C.S.A. Dimensions: image and text 51 x 67 cm., on sheet 57.5 x 80 cm.